John’s gospel reveals the relationship with the Lord through his Spirit. Jesus told us it is God’s WILL we produce fruit in Chapter 14. Here we are told it is God’s WILL Paul is the instrument to proclaim his name to Gentiles. Ask yourself, if you are a Jew (most of them rejected Jesus) or Gentile or of the people of Israel? (See Misquoting Logic by Chris Queen/Hosea) Three separate groups per Jeremiah 31: 31-34; Romans 15:8. 7 Understand, then, that those who have faith are children of Abraham.8 Scripture foresaw that God would justify the Gentiles by faith, and announced the gospel in advance to Abraham: “All nations will be blessed through you.” 9 So those who rely on faith are blessed along with Abraham, the man of faith. Paul further explains there he was unable to obey the law. Anyone who claims they do is self deceived. And the flesh committed to the law can not produce the fruit God requires because it is still the flesh. Jesus called the Jewish leaders, “whitewashed wall” “brood of vipers” “long robes filled with dead men’s bones” “hypocrites who gave a tenth but ignored justice, love and mercy.” Do not become or continue as one of the skeletons in their robes, because alleged churches are filled with those who leaven with the yeast of the Pharisees. In verse 12 Paul sets the remedy for those preaching the law, in the event they will not deny themselves, pick up their cross and carry it to Jesus (Command of Christ) if you want to be my disciples. Paul said don’t stop with the tip, cut it all off. No more beanie wienies. FRUIT? Galatians 5 where Paul explains there are only two kinds of fruit: 1) Fruit of the flesh; 2) Fruit of the Spirit. Can’t get there by the law or your own effort, including the law. Can’t get this fruit without the transformation through the Spirit of truth. The law cannot possibly produce this fruit. Trusting in Jesus by faith alone produces this fruit. Please keep your hands and feet inside the tram until we come to a complete stop. Jesus and I would like to thank you for joining our tour of the narrow gate today. Chris Queen. 2/13/2019. Please get my books available on Amazon and all the rest. 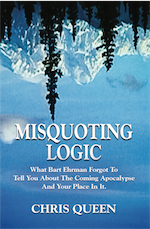 Misquoting Logic Go HERE. Misquoting Calculus Go HERE (amazon). Please hit the Follow Key above and to the right for future updates. Please leave your valued comments in the form below and look at more posts there below the form.